This particular design has hidden design secrets inside and out that will sure to delight you. 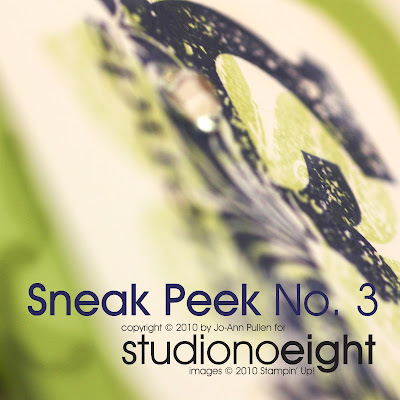 Unlike Sneak Peek No. 2 this design is not traditionally and holds some unique touches that are sure to please any bride. This year it is about punches of colours, Night of Navy and Certain Celery are certainly part of this years hot wedding colours. (Both of these are part of the Shelli's Signature Collection TM and are featured in the Occasions Mini Catalogue January 5 - April 30. I am sure this will find there way into the upcoming Idea Book and Catalogue 2010-2011.